What makes a good life? What does evil look like? Is there a God? Where did this universe come from? What is truth? Giant questions that have been answered in many ways throughout history. These and so many more are waiting in libraries around the world, quiet places that allow us to hear the whispered answers of the past, understand our own time, and dream about a better future. Knowledge is not the same as wisdom, and information can be used for evil as well as good; words can inspire compassion and sacrifice in the service of others, and can be used to justify hatred and murder. But I think there is some kind of truth to the boy’s statement, too. Those who spend time in a library are bound to find themselves in the stacks. Where the world is quiet, the soul is likely to speak peace more often than violence. I re-shelved children’s books at Wareham Free Library’s this morning, returning dozens of picture books, audio books, and serial books to their homes. It’s a peaceful activity that lets me see new books by favorite authors and revisit favorite books my sons have long outgrown. But today, I had an extra task: find and pull out any books with blue dots on their covers. The Onset branch of the library is reopening in a couple of weeks, and the blue dot books belong there. I didn’t think finding them would be much of a challenge. The dot itself is on the cover near the spine, big and bright enough to stand out. The children’s librarian found a whole bunch of them, but I only managed to spot four. Two were in the “P” section, just around the Junie B. Jones books. The third was a Thomas the Tank Engine book, one among many. The fourth was hiding on the “W” shelf, spine to the back of the shelf, page edges to the front. It felt good to find them, but I’m sure I missed more than I found. I checked many shelves, pulling books out enough to check for the blue dots without taking them all the way out. Maybe that was the problem – the books were neither in my hands or in their places, lost in an in-between space. Was I really looking at the books, or just going through the motions to get to the end of the shelf? I’m not sure. Nothing makes me as blind as just going through the motions. I won’t see much when I’m not really looking. Books with blue dots or life, I’ll miss it if I don’t take it in my hands. 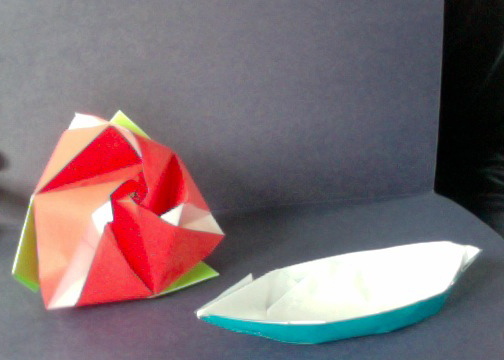 Last week, I went to Rachel Held Evans’ workshop: How To Turn Hate Mail Into Origami. She confessed to giving more time and emotional weight to the few negative comments than the many positive ones that come her way. This isn’t surprising because the brain is hardwired to notice threats – a life-saving tactic when dealing with lions, tigers, and bears without getting eaten, but not so good for coping with blog rants. So she prints out the hurtful comments and folds them up, making flowers and foxes out of scathing Amazon book reviews and hurtful tweets. Reviews come and go, she said. Spend at least as much time on the positive comments as the negative, apologize when what you write is wrong. Focus on the writing rather than the reaction. Stay grounded in what’s real: family, friends, the life you live and love. Develop a tough hide, but don’t lose your tender heart. Fold the bad into origami boats and trees. When I saw Rachel’s origami, I couldn’t see the criticisms and insults. The words weren’t in any kind of readable order, and much of the writing was folded inward, invisible to the eye. Not gone, just not the focus or the final creation. It takes time and attention to create origami out of insult and hurt, but it takes almost as much time and attention to create origami out of blank paper. Since most of us are no longer blank pages, and nearly all of us have some hurt inked on our lives, folding these into something beautiful isn’t just a good coping mechanism: It’s a symbol of how even imperfect and damaged lives are made new and beautiful when held in loving, wise hands. It’s the way of things. Last year’s hollyhocks died, offering the seeds that sprouted new plants a few weeks back. Sometime soon, the caterpillars munching the maple leaves in my back yard will inter their pipe cleaner bodies and emerge with soft, furry wings. Each of us dies throughout our lives, going from one stage to the next – infant to toddler, child to adult. We let go of people when they die, and they will let go of us when it is our turn. There’s no other door to new life, death alone provides entry. It’s just so hard to go through, leaving everything behind for who knows what. I accept this truth, and I make my peace with it every time death claims someone I love. In my soul I know that no one is lost to God, even when lost to me, but I mourn all of them. Every atom in this blessed universe is held fast, but not in the form I know and miss. One day it will be my form, this life I know and love, that I must give over to death. It’s hard to imagine when or how this will come, sitting on my sofa right now, typing these words. But the door of death will open, granting me passage into eternal life. When my time comes, I hope I have the faith to greet it with peace. In that moment, I want to say amen: let it be. With so many people I love on the other side, with these words of saint Francis on my heart, in grateful thanks for those I leave behind, I’ll die to all I know and trust my eternity to the embrace of God. Pardon me is so easy to say when passing in a crowded hallway or reaching for a salt shaker and nearly impossible to utter when real hurt or damage has been done (Is it because someone refusing to pardon a passing stranger or outstretched arm commits a bigger offense?). How do I ask for forgiveness when the damage is profound or even irreparable? The unspoken words pound the walls of my head and heart, bruising and battering me in their escape attempts. Why can’t I let them out, especially when they are the only reparation I can make for the harm I’ve done? When I’m on the receiving end of this pain equation, I have no trouble getting words out; the question is, what words will I release into the world? Speak to send the pain I feel into the heart and soul of another, or speak to release us both from pain given and received? Retribution or restoration spoken and heard: the choice is mine. I know pardon given and received opens the door to a blessing built for two, damager and damaged, even in tragic circumstances. Pardon unrequested and unrequited bars the door. It’s double or nothing: the door is too big to admit an either/or blessing.